The EBM is essentially an ATM for books that automatically prints, binds, and trims, on demand at point of sale, perfect-bound, library-quality paperback books. These books, which have full color covers, are indistinguishable from other books sold in bookstores. A 300-page book can be produced in four minutes (serially, in three minutes) for a cost of consumables of a penny per page (the EBM can produce a book of up to 830 pages). The print on demand possibilities have the guys tickled pink. 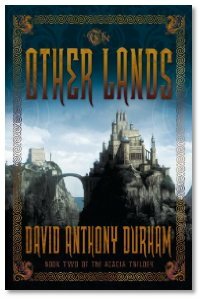 Interview: David Anthony Durham returns to the show to talk about his "Acacia" series, and the recently released second book in the series, The Other Lands. This story picks up several years after the end of Acacia, focusing on the iron-fisted reign of young Queen Corinn, and the magical and political lengths she will go to in order to maintain her position and power. David talks about using the second book as a bridge to the final book in the trilogy, and to explore part of the world that was only touched upon in the first book, and to explore depths in the characters affected by what they're discovering about their history and responsibility for a dark secret. Also, congratulations to David on winning the 2009 John W. Campbell Award for Best New Science Fiction Writer! Listener Review: Web Genii brings us a review of Deader Still by Anton Strout, from Ace Fantasy.